Discover the Mississippi Valley's historic but turbulent past at Laura Plantation on this guided, 5.5-hour tour from New Orleans. Laura Plantation is a restored, Louisiana Creole plantation on the west bank of the Mississippi River near Vacherie. The plantation was run by four Creole women, most notably Laura, for whom it is named. See unique architecture, colorful gardens, and sugar cane fields, and hear stories about all aspects of plantation life along the way. Round-trip transportation and plantation entry fee included. On this 5.5-hour tour, begin with a hotel pickup, followed by a 75-minute drive to the Laura Plantation in Vacherie. Along the way, listen to stories of all aspects of the plantation life. The Laura Plantation tour is considered by many in the tour industry as the best historical plantation tour in the Mississippi Valley. 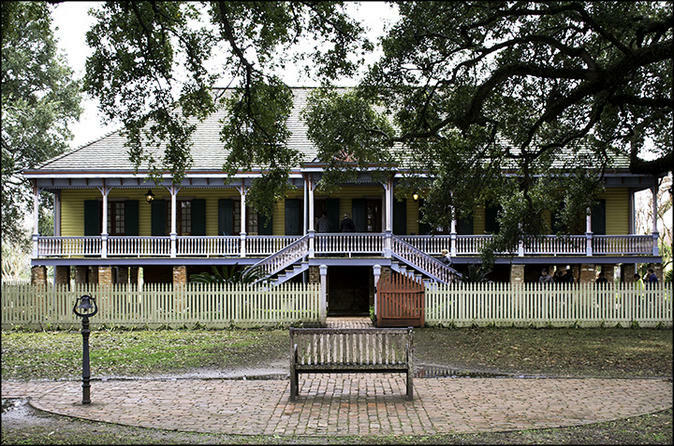 The plantation was run by four Creole women, most notably a woman named Laura, for whom the plantation is named. The women ran the plantation for more than 60 years, using slave labor to do it. See and explore the slave quarters, and discover the unique architecture of the manor house, the colorful gardens, and the sugar cane fields. The house was nearly destroyed by fire back in 2003, but it was rebuilt to the original design using building materials from antique homes. The rebuilding process is a story in itself. The tour concludes with a return trip to New Orleans and a hotel drop-off.